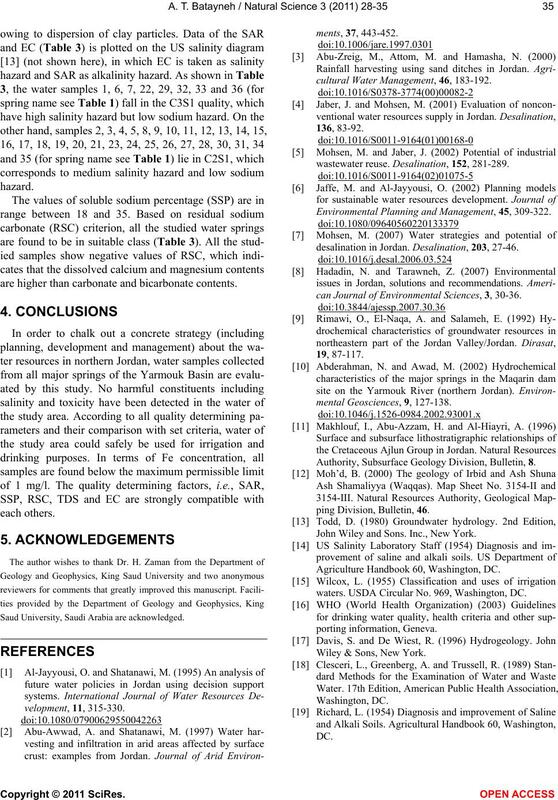 Received 19 May 2010; revised 25 June 2010; accepted 28 June 2010.
degree of ionic toxicity in these water sources. mestic, agricultural and most industrial uses. sources planning and development [1-8]. 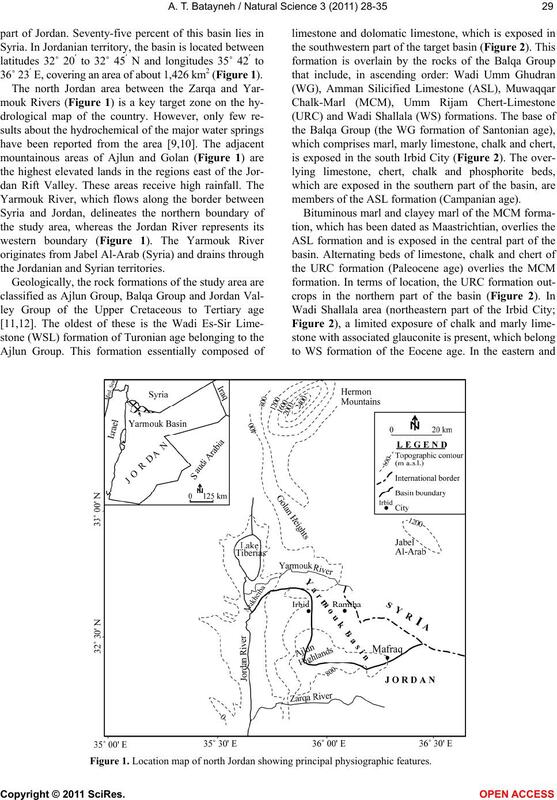 resources such as brackish water. 36˚ 23 E, covering an area of about 1,426 km2 (Figure 1). the Jordanian and Syrian territories. members of the ASL formation (Campanian age). Figure 1. Location map of north Jordan showing principal physiographic features. north and northwest of Irbid City (Figure 2). to prevent possible evaporation effects. –), iron (Fe-), phosphorus (P) and boron (B). versus SSP, SAR versus RSC and SSP versus RSC. 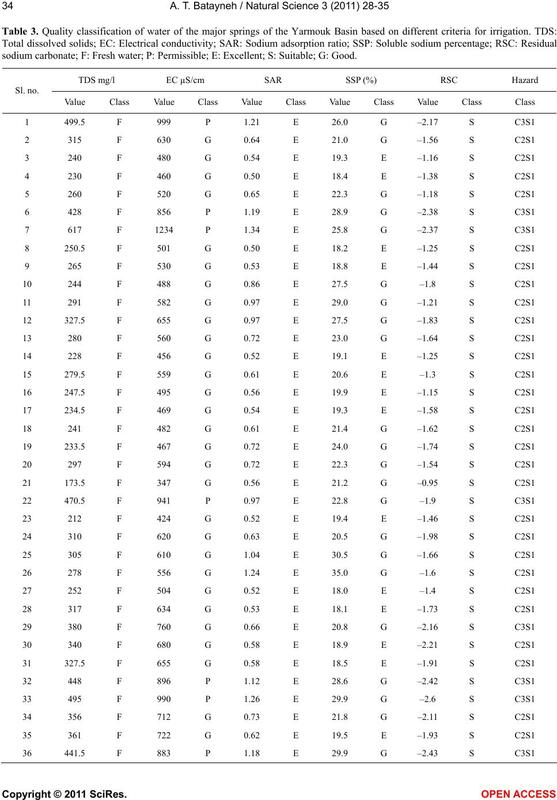 coefficient of 0.69 for 36 data points (Figure 3). 0.0-0.59 meq/l, accounting 5.5% of the total anions. constituents on both the soil and plants . of 1000 mg/l recommended  for most domestic uses. fied as fresh without any hazardous contaminations. 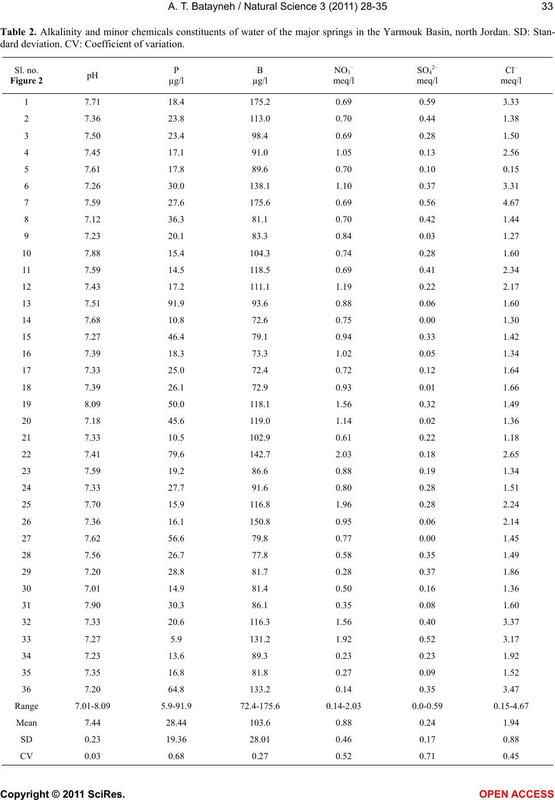 parameter to determine the suitability of irrigation water. Table 1. 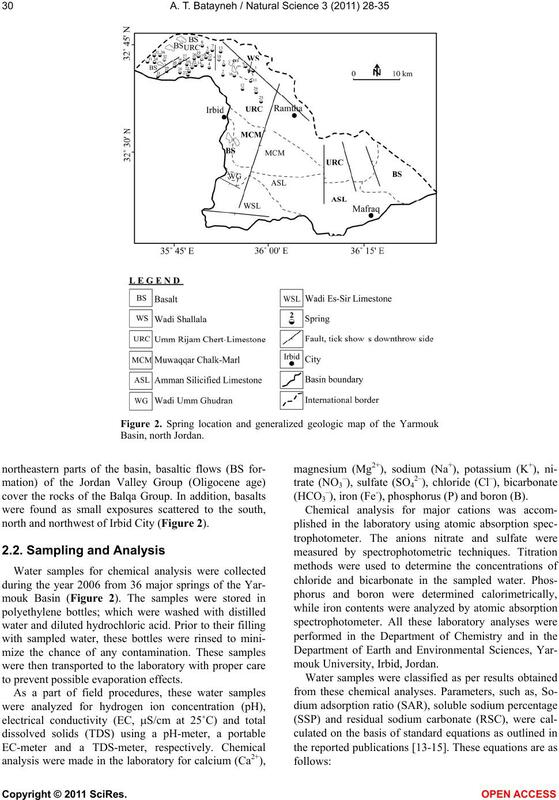 Cations and anions constituents of water of the major springs in the Yarmouk Basin, north Jordan. SD: Standard deviation. dard deviation. CV: Coefficient of variation. sodium carbonate; F: Fresh water; P: Permissible; E: Excellent; S: Suitable; G: Good. are higher than carbonate and bicarbonate contents. 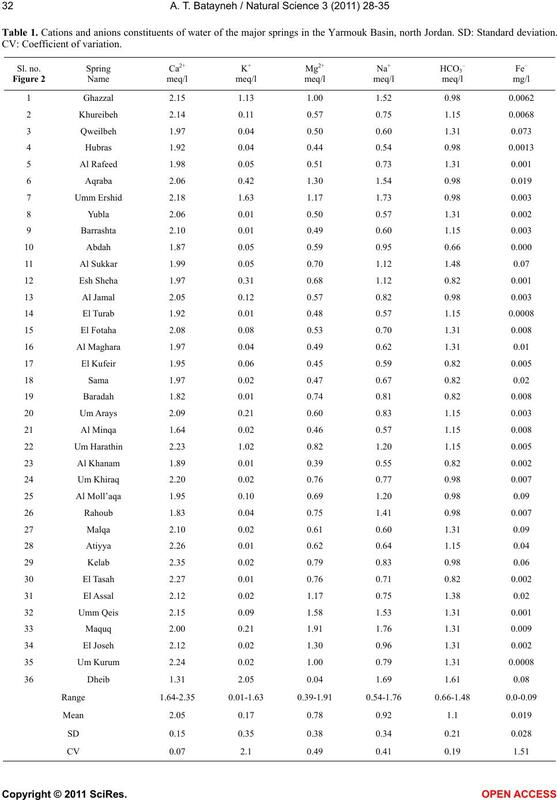 Saud University, Saudi Arabia are acknowledged. cultural Water Management, 46, 183-192.
wastewater reuse. Desalination, 152, 281-289. 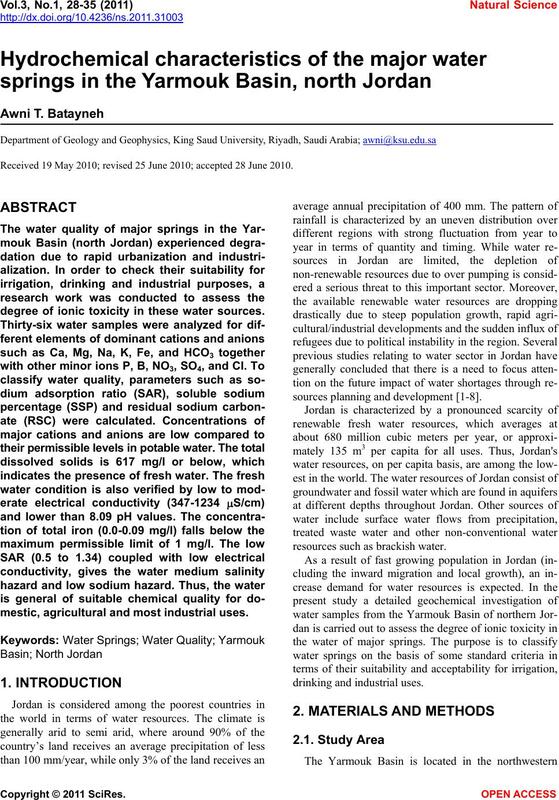 Environmental Planning and Management, 45, 309-322.
desalination in Jordan. 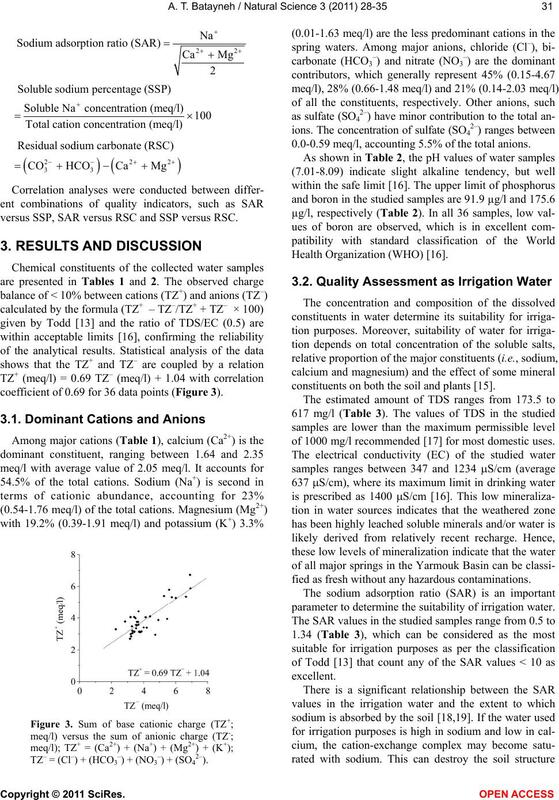 Desalination, 203, 27-46.
can Journal of Environmental Sciences, 3, 30-36. Authority, Subsurface Geology Division, Bulletin, 8. John Wiley and Sons. Inc., New York. Agriculture Handbook 60, Washington, DC. waters. USDA Circular No. 969, Washington, DC.